President Obama's version of America besieged by class warfare with an ever-shrinking middle class is based on false assumptions, explains economist Stephen Moore in the May issue of Newsmax magazine. In reality, he writes, the economic evidence shows everyone is getting richer and the American dream still thrives. 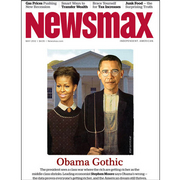 In addition to hard-hitting investigative reports and special commentary from George Will, Michael Reagan, Ben Stein, Dr. Laura Schlessinger, David Limbaugh, Christopher Ruddy and others, you get much more in Newsmax magazine.